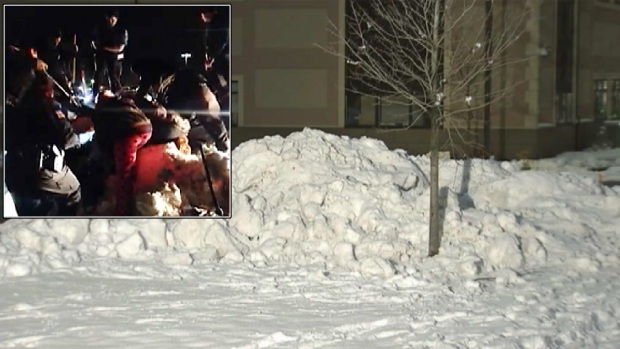 Two boys trapped in a snow pile in Newburgh, New York, for more than seven hours say they heard their friends and family calling for them but couldn't answer loudly enough. Cousins 11-year-old Elijah Martinez and 9-year-old Jason Rivera were outside building a snow fort near Elijah's house on Wednesday night when a plow operator clearing a parking lot unknowingly pushed snow over them. "We started screaming and telling him to stop but he didn't hear us," Elijah said from Westchester Medical Center Friday, where the boys were recovering. "The whole top of the fort just fell on us. There was a little hole, and we kept trying to put our hands through and then we heard the snow plow, so we just yelling," said Jason. "The snow plow just kept pushing more snow over us." Two New York boys building a snow fort were trapped under a mound of powder for hours after being buried by a snow plow Wednesday, police say. Sheldon Dutes reports. The boys heard the plow go by three times, each time piling on more snow. "I was thinking me and my cousin were going to die," said Jason. "Me and my cousin couldn't feel part of our bodies, I couldn't feel my legs, he couldn't feel the whole half of his body," he said. When the boys missed their 9 p.m. curfew, Jason's mother, Aulix Martinez, along with police and neighbors launched an all-out search. Martinez said the two Newburgh police officers who initially responded are her heroes. "They went above and beyond looking for my boys, for both of them," she said. "They wouldn't give up. They were sitting out in the cold." As rescuers looked for them, the boys said they relied on each other to stay alert. Two New York boys building a snow fort were trapped for hours when they were accidentally buried by a snow plow, police say. "We were motivating each other to not go to sleep, keep yelling, keep moving our body, keep trying to break out," said Elijah. Early Thursday, police officer Brandon Rola saw a shovel half buried, started to dig and then saw a small boot. 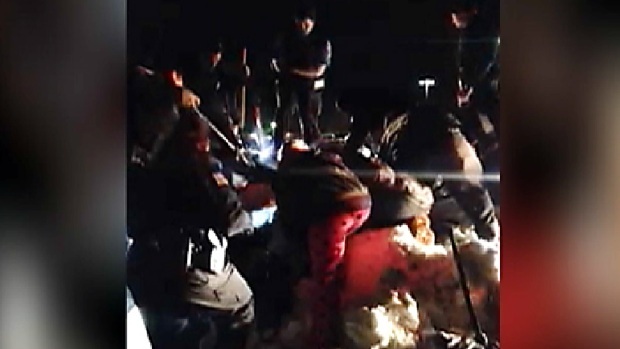 Rescuers joined in, some digging with their bare hands. The boys were conscious and suffering from exposure. Police say they were buried in about 5 feet of snow. "You could just see it on their face, they were just so happy to get out from underneath that huge pile of snow," said Rola. Jason's mother said "they were both mostly crying for each other, 'Is my cousin OK?'" The boys remain hospitalized. Their families say they'll have a full Thanksgiving dinner when they are discharged. -- Checkey Beckford contributed to this report.